Earlier today IG Group posted its Full Year results for the period ending May 31st, 2014. As reported in our earlier post, the year was headlined by profits and revenues that grew in the low single digits, with top line net trading revenues of £370.4M setting a record for IG. Overall, their perfomance tracked that of other brokers as it began strongly but fizzled out as volatility dried up in 2014. We now take a closer look at operational highlights and trends that have emerged from IG. IG reported that it expects to finalize the process of receiving its Swiss license soon. The firm already has an office in place in the country due to satisfying licensing requirements, and expects the Swiss unit to become active to customers in September at the earliest. Earlier in the year, IG stated that in addition to seeking a Swiss banking license, it was in discussions with another regulator which has been revealed to be the Dubai Financial Service Authority. IG expects to satisfy requirements in that country and become licensed in Dubai in 2015. In regards to both countries, IG mentioned high average income as providing a potential business opportunity for them. IG continues to see an increase in mobile- based activity, with a third of trading taking place on mobile devices. As seen in the chart, iOS dominates overall mobile trading, but Android activity has been increasing its market share. 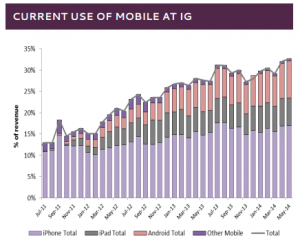 As mobile has become more important, IG has begun to focus on mobile- based marketing campaigns. Reported earlier this month, the initiative is based on marketing customers directly to downloading its app. Due to this initiative, IG added today that within mobile they have begun to develop apps that will provide more of a focus on education for new clients. As reported earlier in the year, IG is planning to launch a new stockbrokering division that will be focused towards longer-term traders and investors. IG expects the program to be launched in September in the UK and Ireland and rolled out to some international markets in 2015. The launch of stockbrokering takes place, as stocks and equity indexes dominate volumes at IG. 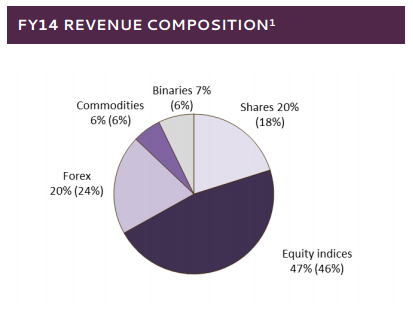 During the year, combined stocks and index volumes accounted for 67% of trading versus only 20% in Forex. The existence of a large component of customers familiar with equities should provide a fertile base for IG when it begins marketing its stockbrokering initiative. Based on composing 20% of volumes, and using comparable revenue metrics from other similar brokers during the FY 2014 period, Forex Magnates estimates IG’s monthly Forex volumes to have averaged around $85B. Like many other online brokers, IG is also calling the current levels of volatility, where some assets are at 25-year lows as slated to rise. Explaining their rationale, they expect quantitative easing to be ending and a possible return of rising interest rates. As this happens, IG expects to benefit from the expected rise in volatility as well as increased returns on its cash holdings. As posted earlier today, Europe was a center of growth for IG. Revenues in the region grew by 16% and now account for 22% of IG’s total net trading revenues. Leading the region are Germany and France which saw growth of 20% and 15% respectively. Despite the growth, IG still considers their European businesses at “a relatively early stage in their development,” thus indicating that the broker has high expectations for the region as a propeller of overall future growth. The optimism in Europe could be considered contrarian as other brokers have been targeting emerging markets as a place of growth. However, IG appears to be seeing an opportunity in Europe by leveraging its product profile which fits interests of European traders, as well as taking advantage of being a large public broker, this providing a brand play as a safe financial firm. In other regions, IG highlighted its US-based NADEX binary options trading operations where revenues rose 54% to £3.1M. While still negligible compared to their overall business, IG continues to be optimistic about NADEX, as recently it has added liquidity providers which led to tighter pricing. Also singled out was South Africa, where revenues rose 12.2% to £5.1M. The results compared to IG’s overall Rest of the World segment which saw revenues decline by 10% during the period. During the FY 2014, IG reported that it had 126,108 active clients, with 92,399 having traded in the previous period. The figure was 7.3% below the previous year’s results, but was partially attributed to IG removing focus from lower sized accounts. As a result of weeding out smaller accounts, primarily in the UK and Europe, IG’s average revenues per client spiked higher, hitting £2,937 vs £2,660 in the same accounting period last year.